Wide leg pants with zip closure, hip pockets and a welt pocket at the back, color: navy/grey stripe, these wide-leg pants are incredibly flattering. This tailored pair is made from 100% cotton. Model wears a size 36. Cropped wide leg pants with zip closure, hip pockets and a welt pocket at the back, color: navy/grey stripe, these wide-leg pants are incredibly flattering. This tailored pair is made from 100% cotton. Model wears a size 36. Wide leg pants with zip closure, hip pockets and a welt pocket at the back, color: red-white-blue stripe, these wide-leg pants are incredibly flattering. This tailored pair is made from 100% cotton. Model wears a size 36. 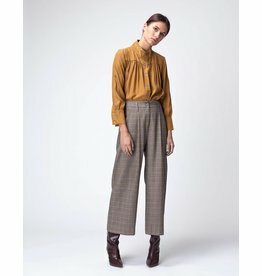 Wide leg pants with zip closure, hip pockets and a welt pocket at the back, color: english check, these wide-leg pants are incredibly flattering. This tailored pair is made from 60% wool 40% viscose. Model wears a size 36. Wide leg pants with zip closure, hip pockets and a welt pocket at the back, color: lightblue stripe, these wide-leg pants are incredibly flattering. This tailored pair is made from 100% cotton. Model wears a size 36.